"Aichi" redirects here. For other uses, see Aichi (disambiguation). 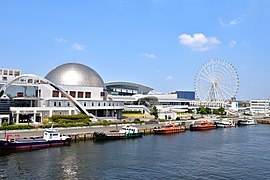 The government of Aichi Prefecture is located in the Aichi Prefectural Government Office in Nagoya, which is the old capital of Owari. The Aichi Prefectural Police and its predecessor organisations have been responsible for law enforcement in the prefecture since 1871. Companies such as Fuji Heavy Industries, Mitsubishi Motors, Pfizer, Sony, Suzuki, Bodycote, and Volkswagen Group also operate plants or branch offices in Aichi. ^ Nussbaum, Louis-Frédéric. (2005). "Aichi-ken" Japan Encyclopedia, p. 11, p. 11, at Google Books; "Chūbu" Japan Encyclopedia, p. 126, p. 126, at Google Books. ^ Nussbaum, "Nagoya" p. 685, p. 685, at Google Books. ^ Nussbaum, "Provinces and prefectures" Japan Encyclopedia, p. 780, p. 780, at Google Books. ^ "Summary of Aichi Prefecture". Aichi Prefecture. Retrieved 23 March 2011. ^ "General overview of area figures for Natural Parks by prefecture" (PDF). Ministry of the Environment. Retrieved 8 July 2012. ^ "Domestic production and sales bases Archived 2015-05-10 at the Wayback Machine". Sumitomo Riko. Retrieved on January 28, 2015. ^ "Yama, Hoko, Yatai, float festivals in Japan". UNESCO. Retrieved 13 January 2017. 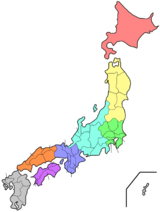 Wikimedia Commons has media related to Aichi prefecture.